Poor eggs. Nature’s perfect food has been dragged through the mud more than a few times. I hate studies like this and the way the news media portrays them. This is one of the many reasons Americans are so confused about what to eat. Are eggs bad? What you need to know about this study. The calculated risk was relative, not absolute. What does that mean for you? In this particular study, it means that when factors were adjusted for total dietary cholesterol intake, egg-eaters actually had a lower risk of cardiovascular disease. This means total dietary cholesterol was the important factor, not eating eggs in particular. Confounding variables probably make this study irrelevant. What’s a confounding variable? It’s anything the researchers cannot control for that could skew the study results. A great example of this is income demographics of the people/groups used in the study. Here’s what I mean…eggs are a relatively cheap source of protein. This means people of lower income can probably afford eggs and may eat more eggs. It is also known that people in lower income brackets often have poorer diets in general because they probably live in neighborhoods with less access to healthy foods and may not be able to afford healthy foods. So what if the people in this study came from lower income households, and possibly ate more junk food (because that’s what they could afford and had access to), and also happened to eat eggs? Is it possible then that it’s not the eggs that caused an increased risk of death? Problem is, we’ll never know because the study didn’t control for participant income and other dietary factors! Are eggs bad? Facts you should know about cholesterol. What does seem to be linked to higher cholesterol and heart disease? Eating lots of sugar, processed foods, and starchy carbohydrates! Keep eating eggs for breakfast…stay away from bagels, muffins, cereal, and waffles! Your body needs cholesterol. It’s a vital building block of cell walls and a critical component of hormone production. Cholesterol is so vital for cellular processes that the liver can manufacture cholesterol without dietary intake. Half of all people who have heart disease have normal cholesterol levels. Most heart attack victims have cholesterol within the normal range. Low cholesterol is not healthy. Low cholesterol is correlated with poor memory function, aggression, suicidal thoughts, and depression. Total cholesterol is a poor indicator of heart disease risk. What does matter? LDL particle size. There are two types of LDL particles: Type A (light and fluffy) and Type B (dense and hard). Type A LDL particles do not stick to artery walls. Type B LDL particles are the real problem. So the next time you have your blood drawn for cholesterol, make sure you ask them to do the breakdown of LDL particles! Statens, which are the drugs prescribed to lower cholesterol, do not save lives in people without existing heart disease. Statens do, however, come with a laundry list of side effects. So why is this one of the most-prescribed drugs on the market again? Oh yeah…$$$$. A low-fat diet (which is low cholesterol by default) is shown to be worse for human health in almost every way. Eggs are good. Facts you should know about eggs. One egg is about 70 calories, and contains 6 grams of protein, 5 grams of healthy fat, and no carbohydrates. Eggs are an excellent source of vitamin B2, B6, B12, vitamin A, selenium, vitamin D, zinc, iron, and copper. Eggs contain lutein, a nutrient that keeps skin and eyes healthy. Eggs contain choline, a nutrient usually grouped with the B vitamins, that most people don’t get enough of. Eggs can be an excellent source of omega 3 fatty acids (buy eggs from pastured chickens or the ones that say “omega” on the container). The protein in eggs is “slow burning”. This means you’ll feel full for longer. Eggs are inexpensive. Even scrambling up a few of the organic pasture-raised variety is less expensive than hitting the drive thru every morning. Eggs are a whole food that comes directly from nature. Whole unprocessed foods are a superior choice compared to the typical carb- and sugar-loaded American breakfast of bagels, muffins, cereal, toast, donuts, or pancakes. Compared to standard American breakfast fare, eggs come out on top! Are eggs bad? Who should avoid eggs? I’m going to say this again for those in the back: eating eggs is probably a better choice than standard American breakfast fare such as bagels, muffins, and sugary cereals…for everyone. That said, there are certain people who should be careful about the amount of dietary cholesterol (not just eggs) they consume. Some people are “hyper-responders”, meaning eating foods containing cholesterol may mildly raise LDL cholesterol. This would mostly be a problem for those with genetic disorders like familial hypercholesterolemia. And I’ll mention again that, even for “hyper-responders”, replacing eggs with junk breakfast foods like muffins and bagels isn’t going to lower your risk of heart disease…and may increase it! Eggs are healthy. I plan to keep eating them. Every day. Eggs are an excellent source of protein and vital nutrients, including cholesterol. 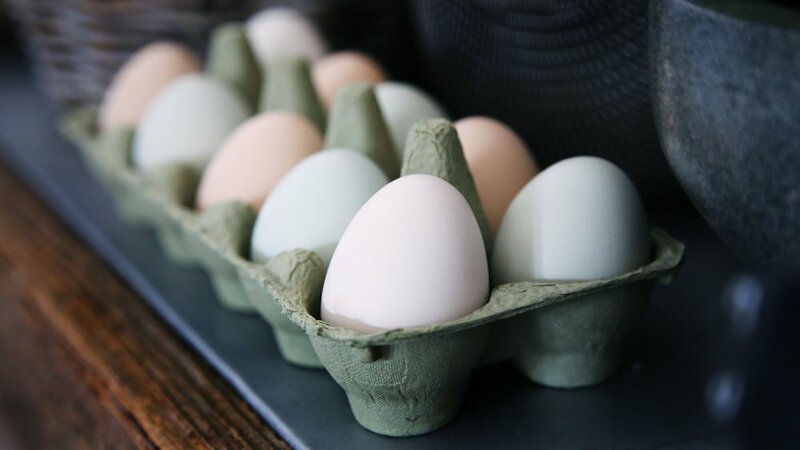 When eaten as part of a diet low in processed foods and sugar, and high in nutrient-dense vegetables and fruits, eggs might just be the perfect little package of goodness! Nature knows best! 1. Zhong VW, Van Horn L, Cornelis MC, et al. Associations of Dietary Cholesterol or Egg Consumption With Incident Cardiovascular Disease and Mortality. JAMA. 2019;321(11):1081–1095.